THE NEW MODEL S651 IS NOW IN PRODUCTION. SHIPPMENT HAS STARTED IN JUNE 2007. 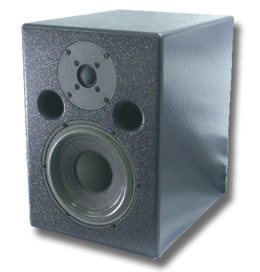 The S651a is the ultimate near field monitoring speaker system. For all demanding professional monitoring application like recording and broadcast studios, mastering, TV-production, for large control rooms as well as the smallest OB-vans (listening position from 0, 6 to 2m). In small control room (up to 45m3) it is the obvious choice and will act as main monitor thanks to its extended response. S651a offers the ultimate accuracy for studio monitoring, low distortion, high sensitivity, linear accuracy at all power levels, wide bandwidth and high peak SPL capabilities for the most demanding dynamic material. The symmetrical design of the S651a eliminates the need for different left and right speakers, improves the stereo image and eliminates HF & Mid frequency diffraction irregularities. The design also makes it an ideal choice for multi channel set-up i.e. 5:1 surround. The trademark of S651a is the uncoloured vocal midrange, the high output and the revealing and immediate response of the slightest touch on your mix. 1" Coated fabric dome, voice coil immersed in magnetic fluid. The build in power amp has been carefully matched in order to fulfil and take full advantage the drivers acoustic capabilities and the acoustic tuning design. The excessive amplifier headroom ( 290W ! ) provides a sonic performance that is truly remarkable for a box this size.